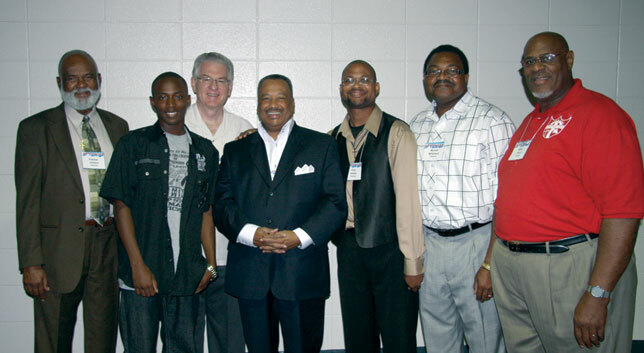 Pictured with new SBC President Fred Luter Jr., center, are from left, Rudolph Johnson, associate pastor of Lawton, God’s Family Community; Cory Elliott, member, Lawton, Mind of Christ; Anthony L. Jordan, BGCO executive director-treasurer; Rich Gettens, pastor, Lawton, Mind of Christ; Michael Williamson, pastor, Lawton, Northside, and Walter Wilson, pastor, Lawton, Friendship. NEW ORLEANS (BP)—Native New Orleanian Fred Luter was elected by acclamation Tuesday, June 19, as president of the Southern Baptist Convention. He was nominated by David Crosby, pastor of First Church in New Orleans, whose three-minute nomination speech was interrupted four times by enthusiastic applause. Luter grew Franklin Avenue from a remnant 65 people in a white-flight neighborhood to a congregation of more than 8,000 “when Hurricane Katrina plowed through this part of the world, destroying their facilities and scattering their people all across America,” Crosby said. New Orleans, First took in the Franklin Avenue congregation after Katrina left the newly renovated worship center in 13 feet of water for three weeks amid flooding across New Orleans and the surrounding region in late summer 2005. The two pastors, Crosby and Luter, both with a heart for the city, began to work together in ministry. Out of that relationship, Luter asked Crosby to nominate him when—in January, after prayer and a word from the Lord pointed out to him by his wife Elizabeth—the Franklin Avenue pastor stepped forward to be a candidate for the SBC presidency. Luter’s election comes at a time when Southern Baptists are seeking to turn around a numerical decline and to elect leadership more representative of the ethnic diversity that exists in the convention’s 40,000 churches. Ed Stetzer of LifeWay Research says the percentage of non-Anglo churches has moved from one in 20 to one in five during just the last two decades. Southern Baptists “are already a convention with great diversity in our membership ranks and our churches. If we are faithful in our work, this diversity will continue to grow,” Crosby said. “We need Pastor Fred at the head of the table, helping us understand our mission field and our mission. It is time to tap the great resource of his experience, wisdom and passion for this wider purpose. Luter, on stage already, could be seen wiping tears from his eyes at the extended applause that followed the conclusion of Crosby’s nomination speech. It’s customary, current SBC President Bryant Wright said, when there is only one candidate for elective office, for the SBC recording secretary to cast one vote for everyone. “However, this chair on this occasion believes this historic moment should fully belong to the messengers of the Southern Baptist Convention,” Wright said. He instructed the messengers to stand if it was “their pleasure” that Luter be elected president. As Luter came to the podium, he wiped his eyes, pointed toward Heaven, and wiped his eyes again. In 2011 Luter became the SBC’s first African American first vice president and in 2001 was the first African American to preach the convention sermon. He also served on the committee that proposed a revision of the Baptist Faith and Message in 2000. He is a popular preacher at revivals, state conventions, evangelism conferences and other Southern Baptist gatherings. Some observers felt it was appropriate that Luter’s election took place on the day many celebrate “Juneteenth” and the anniversary of slavery’s end in the United States. Rite of passage parenting: In the picture—or not?